Kids like nasturtiums because they are edible flowers that are easy to grow, beautiful to look at, quite delicious, and the perfect garnish for a kid’s party treat. Because bugs dislike the smell of nasturtiums and avoid anything growing around them, they are good companions to plant in your vegetable garden and grow lovely blossoms all summer long. They like full sun and grow well in pots for patio gardening. It will be six weeks before the flowers are ready to harvest. 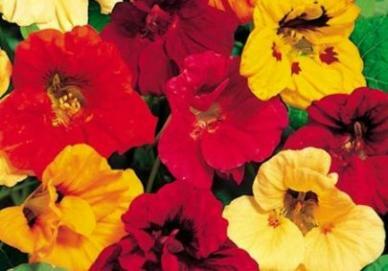 The peppery taste of nasturtiums gives a nice tang to salads, and the spicy blossoms make a beautiful presentation. Fill them with cream cheese and chopped nuts for an appetizer or use them as a garnish. Nasturtiums are rich in vitamin C and minerals. Both leaves and flowers are good to eat, and the more you pick them, the more they grow. Place these edible flowers as a topping and turn ordinary cupcakes and other desserts into beautiful treats. Serve immediately, nasturtiums wilt after an hour or two so eat them right away.